Someone is home from college with a cute nose piercing and a copy of Freud’s The Uncanny that must be read in the next 6 days and she is very, very tired and has been very, very sweet, apparently newly charmed by her folks and laughing at her younger brother’s antics for the first time ever, unless you count the fleeting moment captured in the photo at top some years ago. My favorite photo ever. 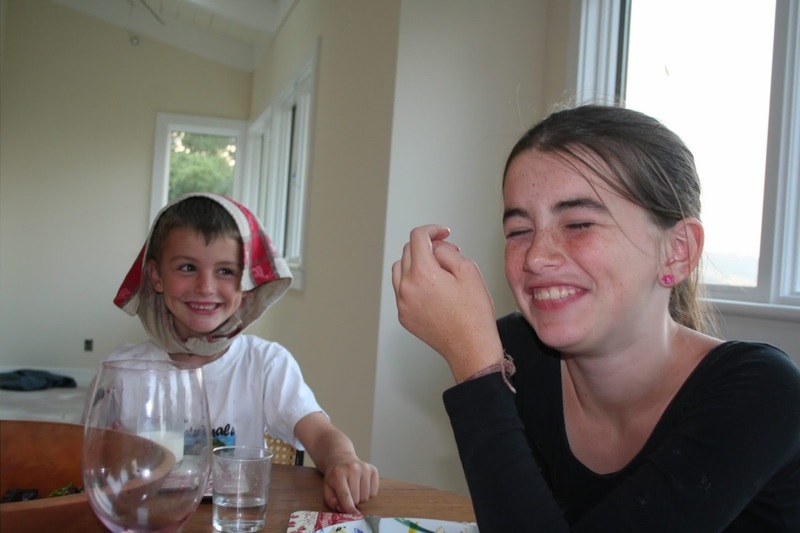 It was delightful watching our children tell stories and laugh together at the dinner table last night. I thought, this is how family dinner was supposed to be and never, ever was. Really, guys, it wasn’t. All those years, it was tense. Much bickering and sighing and baiting. I think there was something semi-disastrous about our kids' difference in age, gender, and maturity level and now there isn't. Mark and I were so happy we didn’t even mind listening to Owen’s records, which he played all through dinner and which occasionally. . . grate. He's accrued an eccentric collection of vinyl that includes almost every album ever made by ABBA, plus some Steely Dan, Kenny Rogers, Linda Ronstadt, and The Many Moods of Christmas. Owen is so blissfully uncool he is totally cool. Have you listened to Kenny Rogers lately? A lot of self-pity and impotence in those songs. I'd never really noticed before. Just listen to Lucille or Ruby, Don't Take Your Love to Town some time. We ate Marcella Hazan’s spaghetti with tomato and butter sauce about which more than enough has been written (but in case you haven't read it -- make this sauce!) For dessert: Hazan's coffee cake with winter fruits which I’d been wondering about for years, a very plain, pale cake full of chopped apple, chopped pear, and thinly sliced banana. I am wondering no more. Not the best thing I've ever made, but here's the recipe if you're curious. Today Isabel took Owen out for lunch, a first. Later, he told me they mostly talked about "how you and Dad are getting weirder and weirder." Below is one of the waffle cupcakes I made for Owen over the weekend, fulfilling my end of a bargain. First, you bake cupcakes using yellow cake mix, reserving some of the batter. 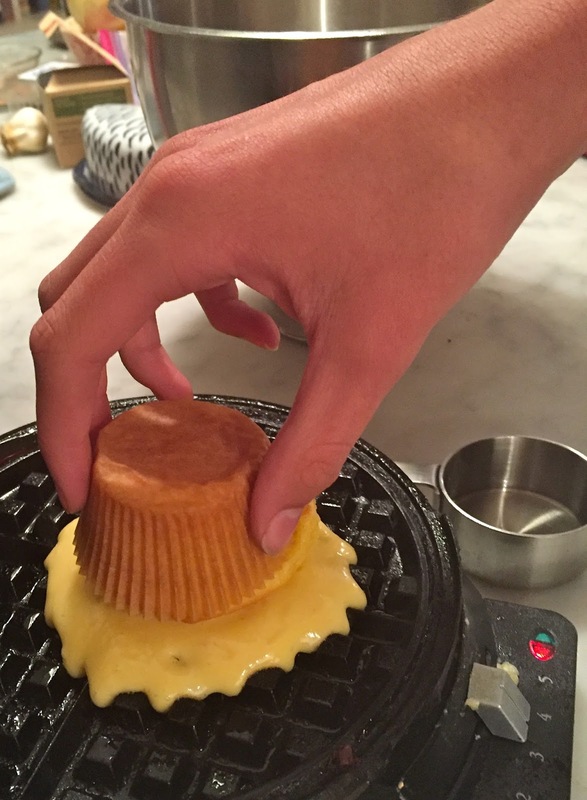 Once the cupcakes are baked, heat a waffle iron. Pour some of the reserved batter on the iron then place a baked cupcake face down in the batter. Let the waffle cook. The top of the waffle (now the top of the cupcake) will be nice and crispy, the underside slightly raw, and the whole production quite handsome, as you can see. It didn't taste like anything special, but taste wasn't the point. I'm not hosting Thanksgiving this year and for that, among many other things, I am extremely thankful. So I'm about a year behind; I have a high school senior and an 8th grader, and it's better between them than I deserve. But I am feelin' ya, just sayin'. The 8th grader is going through what I hope will be a mercifully brief "classic rock" phase, and now I am envious that it is definitely NOT including some Kenny Rogers. I already can provide him with the ABBA and Linda . And a LOT of Billy Joel. But NOOOOO, it's The Who and Led Zep and the Stones and yes, even some AD/DC. In the meantime, made those Brussels sprouts with pancetta from Sunday Suppers at Lucques and now I wonder, why does this bee-yotch think we all have veal stock languishing in our freezers when I had to make a lot of phone calls and pay $7.99/lb. for the bones to make it? The BS w/P were very tasty, though. Veal stock. Ugh. I'm with you. Your son sounds very classic boy -- I think Mark would be thrilled if Owen started listening to Led Zeppelin. He's tried to get him into The Doors, but it hasn't yet taken. Owen started with "Hotel California" and "Mamma Mia" and then he started putting on headphones so I had no idea what he was listening to for a lng time. When he got the record player, he inherited all my ancient records (yes, the Kenny Rogers) and bought some of his own and so I know exactly what he's listening to and it's a pretty funky mix. How sweet! I love that she's reading Freud. I know. I love that they're still teaching Freud. I remember that time! My brother and I had gotten just old and mature enough to decide we enjoyed each other's company, in small doses! I know it must be really fabulous to see that happen as parents. I don't know how valuable it is to learn Freud, but it certainly educates one about what is often referred to in common discourse. I hope you all had a good holiday. I was hosting, so I enjoyed it a bit between slaving away in the kitchen! Are you going to do your annual Thanksgiving recipe roundup this year? I look forward to that post so much!! Finally understand your title - Love Cake!